Trading for me is all about the metagame. 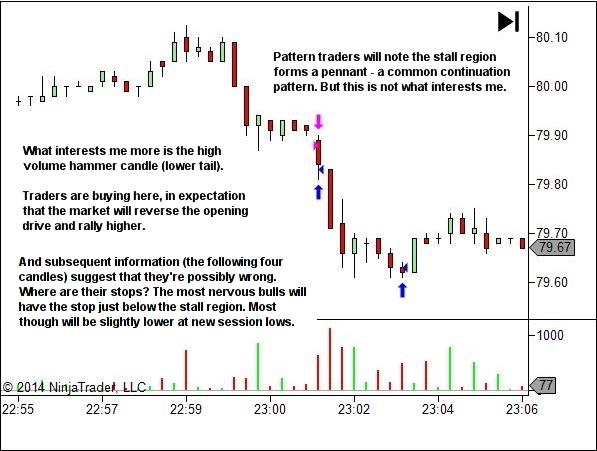 My aim while looking at price action is NOT to find patterns in the traditional manner, but rather to look at that price information from the perspective of the other traders. What happens if they're wrong? It's orderflow that moves price. 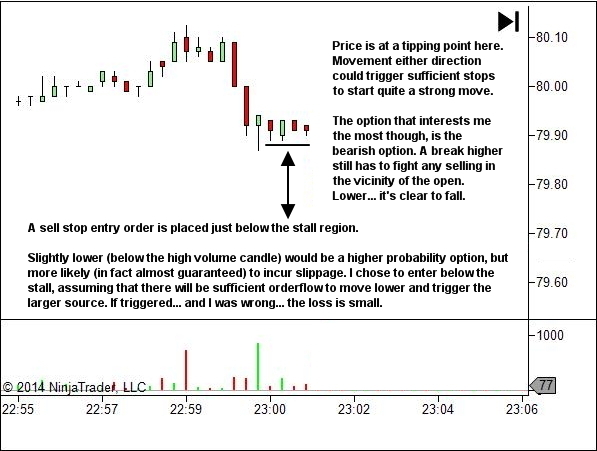 And if you can find the times and places on a chart where enough other traders are forced to act (usually where they know they're wrong) then you've found a source of orderflow that may just offer trade opportunity. What doesn't happen… is important information. And that can, in the right context, provide nice trade opportunity in the opposite direction. In this case a shallow pullback entry short and a good start to the week. This is such an important aspect in trading. I often land up committing these mistakes of trying to take entry in anticipation that price will reverse the opening move. Thanks Lawrence! 🙂 I’m glad you got value out of the article. Lance, would you have anticipated the same for a currency pair without being able to see the volume? If you prefer to not use volume then that’s fine. If you look through other material on my site, and of course in my ebook series, it usually plays almost no part. It’s not officially part of my strategy. I do chart it and only take note when something really out of the ordinary catches my attention, such as a sudden large spike of volume. So the concepts in this article still apply with volume. 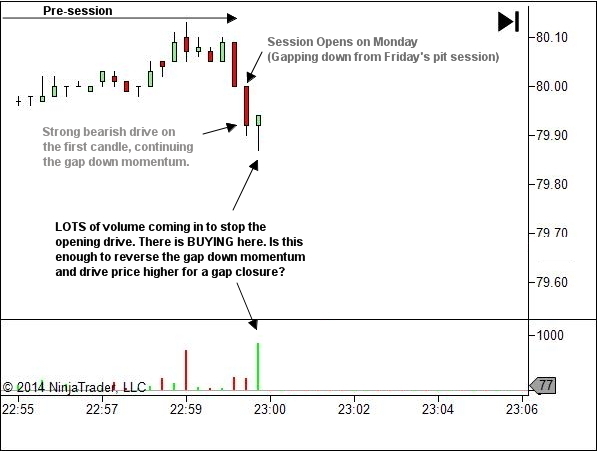 The gap down and opening drive found some buying with a bottoming tail. Watch the follow through. Can it push higher. No… instead it stalls sideways. Think of the mindset of those who did BUY hoping to catch a reversal. Feel the stress build within the stall region. That is what we’re trying to find – fear and stress in market participants. So yes… the same concepts apply in currencies. Hmmm when I think about it, I have been that counter trend trader although I wouldn’t enter the trade until it broke the hammer of which will add to the effect and yes, my stop would be under the stick. Never again! Yes, but sometimes counter-trend is appropriate. It’s all about context, real-time assessment of sentiment and real-time adjustment of the plan to maximise opportunity when we’re right and minimise loss when we’re wrong. Thanks for this article . I regularly follow your facebook post. Your articles really helping me to look market from different perspective. Hello Lance, I follow you long time and really love your style and work. You have much much more experience. At this time I must kindly disagree with yours comment on Volume and “buying power”. I will explain. 1) In every candle is always the same number buyers as sellers. Volume measure all exchanges at given time period. 2)Volume is NOT green or red because more buyers than sellers. In this case when Volume is green it means bar is open lover than bars is close. THEN – bars close is not higher because there is more buyers. BUT Bars Close MAY be higher because more aggressive buyers anticipated. (aggressive = market orders) Then you should say more MARKET BUYING orders than market selling orders. But things are more complicated and it may not be true because it: MAY happen that bar may have higher close with LESS market buying orders then MORE market selling orders. It all depends how is correlation between aggressive market orders versus absorbing limit orders. How market orders are absorbed by limit orders. With respect Hope my words are clear. 2) Again, I completely agree. 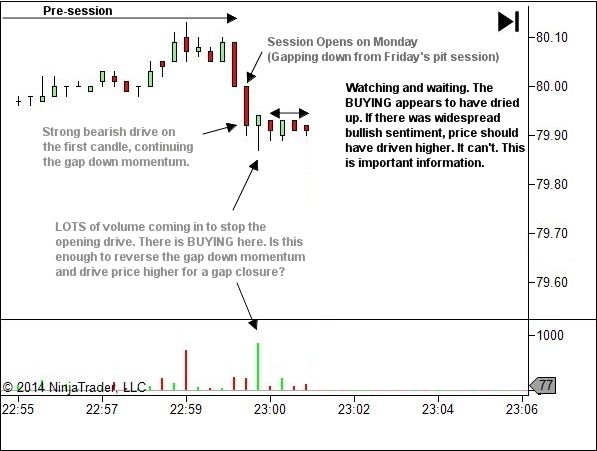 I’ve not anywhere ever said that a green volume bar in NinjaTrader means more buying than selling. The colour correlates to the price bars opening vs closing price, exactly as you said. I suspect the problem is simply a communication issue. Perhaps a result of “lazy writing” on my part, where I assume that the reader is reading the article within the context of everything I’ve written in the past. Of course, that is not always the case. But I can’t be starting back at first principles on EVERY blog post. 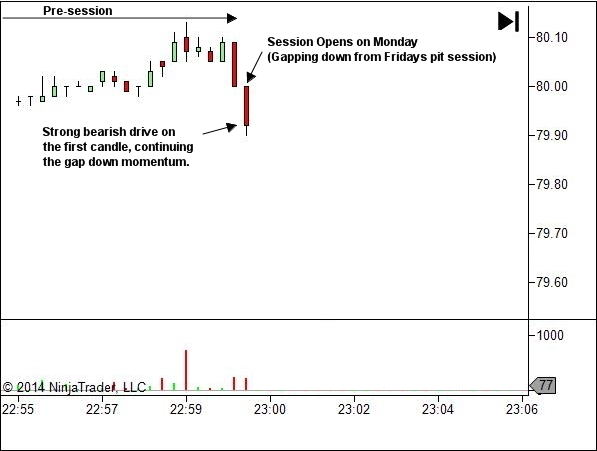 What this means is that the candle we are currently examining shows a significant increase in volume, in which the buying pressure has overwhelmed the selling pressure, resulting in a strong bullish close to the candle. In other words, the net effect of all orderflow throughout the life of this candle was bullish. Hopefully that has cleared up any confusion. Let me know if you have any questions or further concerns. How do you know that buying pressure has overwhelmed the selling pressure only by increase in volume and strong bullish close to the candle? Without seeing all candle orderflow how do you know the net all orderflow throughout the life of this candle was bullish? My main point is that price can go Up with higher selling pressure/with net bearish orderflow. We don’t know till we see all orderflow. We can’t know only by Volume and Close as you assume. Btw.price can go up with zero market buying orders. Within the later stages of this candle the orderflow drove price from the low to close at or near the high. ie. Bullish. This is NOT making any claims about sentiment beyond this candle. Simply that within this candle, it closed bullish. The net effect of all orderflow which drove price into the close was bullish. For price to rise there MUST be buying at the ask/offer, sufficient to overcome whatever limit sell orders are sitting passively at that level. I am of course making an assumption here that the market is liquid and has multiple levels of orders on each side of the spread, as is usually the case in the markets I trade. You say price can go up with zero market buying orders. In liquid markets price will rise as a result of orders executing at the ask, either as a BUY MARKET order or a BUY STOP order (which is still executed as a market order). Ruling out any liquidity gaps or other such means through which the spread might move without order execution, how can price go up without buying? Or am I misunderstanding what you’re asking entirely? Second case: if you make 100 selling market orders at 4490.0 and there will be waiting 200 buying limits price will not go down. And in same time there will be 5 (or 500 no matter) buying market orders and I move all my sell limit orders from 4490.25 (and higher) to the point 4493.0 price will jump higher without sellers. In this way i may manipulate price. With LESS buyers price CAN go strongly up. Often you are saying “apply to all markets all time frames”. I’m saying NO. And in your example we can’t know why price/candle moved higher only because green Volume and bullish close. 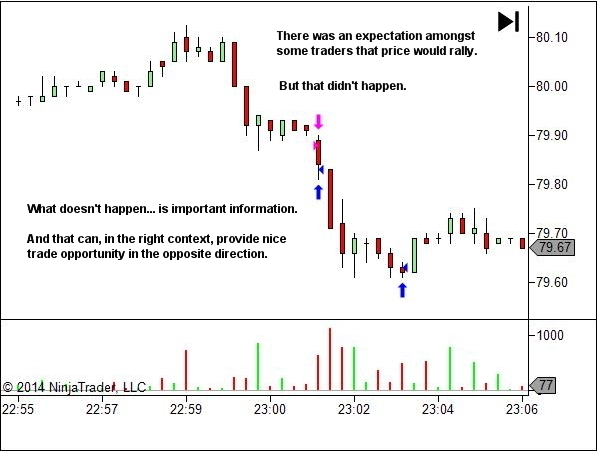 Typically when I say that price action principles apply to all markets and all timeframes, it’s included with acknowledgement that trading occurs in markets with sufficient liquidity to ensure execution without significant slippage, and also sufficient movement available in price swings to allow for profit after overcoming costs. We’re not trading illiquid penny stocks or options contracts here. But I’m sure there are probably examples in my writing where that extra clarification has not been provided. If you can find some and you feel that the extra clarification is warranted in that post, let me know where. I’m more than happy to add the extra comment if I agree that it is necessary. To your example, yes it’s clear that if you’re the ONLY seller at the ask price and there are none at several price points above, and you move your sell limit orders higher, and then a smaller buy order comes in… the last sale price will move higher. But the net effect of all orderflow throughout this sequence is still bullish. The passive buying at 4490 plus small aggressive buying at 4493 overcame the aggressive selling at 4490 and zero passive selling for 3 points higher, resulting in price moving higher. I still don’t quite get what we’re trying to achieve here??? The point of the article is that a high volume bullish candle can create within other market participants an expectation of reversal. 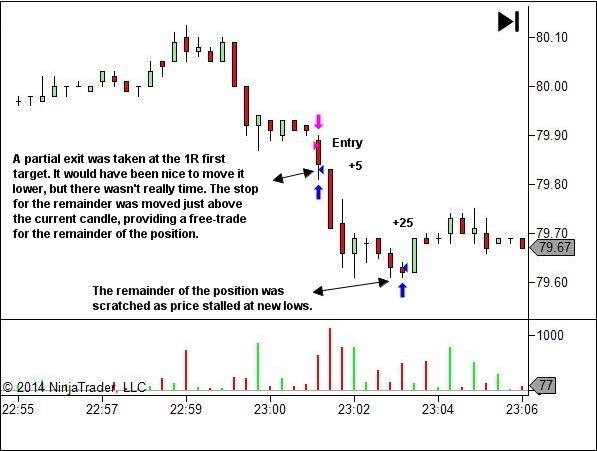 Opportunity can be found when such a pattern fails, if we can get in at or before the point of the failure, with our trade helped by the exit orderflow of anyone trapped in that long position. That’s all I’m targeting – a failed move against market bias. Yes, understand point of this article. And agree. My point was that (2nd picture) statement “there is buying power here” (assumed that you mean buying market orders) may not be true (that price can go up with buying market orders only). Yes, this is the challenge of text based articles. Unless both the reader and I are operating with the same underlying assumptions, it can easily lead to confusion. It’s my job as the writer to try to limit that risk. But it’s not always successful. I’ll admit I do get lazy sometimes in my writing. When I talk about orderflow being bullish or bearish, it’s considering the net effect of ALL orders transacting within that time period. All buying (regardless of whether via a limit order or market order) vs all selling (again regardless of whether via a limit order or market order). When the full sequence of orders have been executed, what is the end result? If price has rallied, then the buyers have won. Bullish pressure overcame bearish pressure. If price fell, the sellers won. Bearish pressure overcame bullish pressure. As to the exact composition of the orderflow that produced that end result, you’re right that it can’t be determined simply from volume and price. It wasn’t my aim to do so though. My intent was simply to suggest that “whatever the individual orders”, they acted to drive price higher. First case: Yes Lance, liquidity is big part of it. If there are only limit orders and spread is increased, price can move as well.